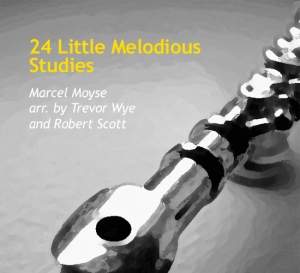 Trevor Wye and Robert Scott have provided easily piano accompaniments to each of the 24 Melodious Studies that underscore key musical ideas and highlight the musical lines. The flute melody’s rhythmic skeleton is sketched above the piano part. These accompaniments provide a tool for teachers and students that augments and extends the etudes rhythmically and harmonically.